"I think we should all rush it, there's no way that this is stronger than all of us." Chadwick said, "and, the simpler the plan the less that can go wrong." 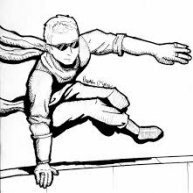 Chadwick had been walking in the back of the group so he hadn't been able to see what was going on, until that giant snake thing had attacked the group of thieves. I always miss the interesting stuff, he thought sullenly as he moved closer to where they were interrogating the last of the thieves, I never get to fight anymore. "that's probably smart, there's some people back at the tavern that could help. Do you want to go get them?" Zan watched a kid walk in with a cloak on that was way to big for him walk over to Darkness and ask him about some kind of plan. Zan was curious now, he walked over to the kid, "what's this plan?" he asked, looming over the kid. @I think I am here. "Yeah, could have been worse I guess" he said as he picked the glass and drank it, filling his brassmind slightly to help with the heat. He looked over at the girl who walked in and, after she ordered bread, ignored her. Chadwick followed Aldred out of the tavern, and joined the group, "do you know what took them?" he asked. Chadwick purred slightly, although it came out more like a growl, Chadwick shook as Aldred stood up "fish is meat, and I like meat" Chadwick said as he joined Aldred at the top of the stairs.